Join the discussion on our forums! Come discuss Soggoth the Slitherer over in our dedicated Soggoth the Slitherer discussion topic. This card should have had the special text "can't be targetted by battlecry or combo on the battlefield"
Days of precious 15/19 Soggoth are over with all the silence tech flying around. Also, that text would have been more fair since it couldn't be duplicated either. Btw it's a minion i played a LOT with handbuff paladin back in the day before Vilespine Slayer, Psychic Scream and Shadowreaper Anduin, the intro sound is way more majestic with the big *Thud* it makes when it hits the board. Now with cards like Voodoo Doll it's just sitting in my collection, forever. Also it was a fairly tricky combo to pull off, or rather survive until you could pull it off. Adding this line would be fair in my opinion, it's still heavy cost for its stats as is. Not good enough to play. Not bad enough to dust. Just rare enough to brag about to friends. Best when discovered from Free From Amber. It can be good off of Stonehill Defender too in certain match ups. I wouldn't maindeck this but it's been good to me when I needed it. If you use in a deck suited around it, its really good. Brann Bronzebeard + Don Han'Cho makes it a 15/19 Taunt, good luck getting rid of that. MSoG Goons made it even better, but its a decent card without buffs and can save you a turn or two. Wait Whats that ? Grimy Gadgeteer keeps targeting Soggoth the Slitherer ? Whats that It I have a 11/15 Taunt That cant be targeted by spell removal? I loved this card before but with MSoG, this card is insane. Greetings there. Time has come for another review, so today we got Soggoth the Slitherer in our scope. Let's begin with stats distribution. He is 5/9, which equals a 7 mana creature (Captured Jormungar) with a 1 stat off, with taunt and spell shield, let's call it like that, for 9 mana. So, what can we count? 5/9 as 6.5 mana, taunt(1 stat) as 0.5, and spell protection, as 0-1 stat fee(Faerie Dragon, Spectral Knight) for 0.5. Let's also remember Arcane Nullifier, as he follows the same math, as i counted. So, Soggoth's value-manacost should be 8 mana. Why is he 9 mana then? Maybe, because he is a huge minion, they counted each bonus as 1 mana, as they are combined. Taunt + Spell shield is a very unpleasant combo, because taunts are usually removed with Spells, and spell-immune minions are killed with minions. So, here we have a guy who cant be Hexed, Polymorphed, Entombed, Mind Controlled(if anyone still remembers this card), and so on. And he has 5 attack and 9 health, which will kill or heavily damage several minions in most cases. He is enough to take down most 1-6 drops, and also have some health, that cant be finished off with pings/direct spells. So, he might kill few big ones. Now, let's see, which countermeasures people might have to get rid of him. First of all, paladins shouldnt take much effort to enroot him. They carry Equality, Aldor Peacekeeper and/or Humility + Stampending kodo or Book Wyrm. Anyfin-paladin can spend his Anyfin Can Happen(1st one), to invest 12 damage into him, if all nessessary murlocs have died by that time. However, if the paladin spends 2nd Anyfin, murlocs will have 8 attack, which means he cant just 1v1 trade with the legendary. He can consume 1-2 murlocs, saving you 8-16 life. Warlocks is an intersting one. If it is zoo, he can have real problems with killing Soggoth. It would take him double Power Overwhelming, which weren't spent by turn 9+,keep that in attention. Or chargers like Leeroy Jenkins, Doomguard, which are not enough my themselves, taking 3-4 damage worth of minions and buffs, or, in best caus efor us, his entire board. Reno variation can use Twisting Nether, Leeeroy jenkins + Faceless Manipulator combo(hah, just realised, he would just copy your Soggoth with it). Another powerful way is Sylvanas Windrunner + Power Overwhelming or Shadowflame. In that cause he will be your problem, not warlock's. If hunter doesnt have Deadly Shot, which lands on Soggoth the Slitherer, or Savannah Highmane, while Tundra Rhino is on board(count, how often you see this scenarion. I cant remember more than 3 times), he will have real issues. Or have Sylvanas Windrunner + Fiery Bat + Kill Command to roll the chance to get your taunt. Priests dont have much to do, but Pint-Size Potion + Shadow word; horror, and any cards that can interract with 3 attack minions. Or he will waste both potions to steal it, but it will require both of them in hand + a toll to steal past turn 9, which should be a rare case as well. Oh, Sylvanas Windrunner + Shadow Word: Death. Still a 2 card combo, which he might not have. 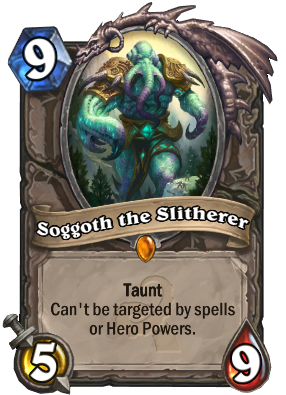 Other classes should have real troubles with Soggoth the Slitherer, except warrior with enraged Grommash Hellscream. Moreover, the only popular neutral threat that can deal with Soggoth is Sylvanas Windrunner, as even Ragnaros the Firelord cant kill it, leaving on 1 hp, which should be ended with a minion sacrifice.There is also The Black Knight, but now he is VERY uncommon. Like, you may meet him once per 20-30 matches, but everything may change after Gadgetzan's taunt fiesta. Nowadays the only deck that use him are Astral Communion-ramp druid and some warriors. Very rarely anybody else, but might be. What is more, warrior with his "BUFF STUFF +x/+x, give your taunt even more heaviness" can utilize Soggoth really well, as the healthier Soggy is, the more minions it will consume to die. Same goes for Grimy Goons faction in general. So, to finish the line, I can say that this legendary is interesting. It can be Overpowered, it can be underpowered, everything is considered by situation he is palyed into. All in all, he is a sticky guy to be faced against, and can cause some unfavourable trades for your opponent, or will give you a chance to clear the board, if enemy chooses not to run his boys into it. Does he worth crafting? I dont think so. Only in case of you liking it badly, or wanting to try some heavy-lategame-oriented control deck, or just want to craft one of the missing leegndaries for your collection. Does he worth dusting. Same, i dont think so. Ask yourself, whether you want him to be in your collection, or in your deck(s). If not, or if you need dust to finish a legendary/deck you want - well, you can dust it, at your own farewell. Just received him from an arena package and tried him in a Paladin-Dragon deck instead of Chillmaw. I think he performs quite well together with Tirion Fordring. Probably not the strongest legendary you can end up with but in certain situations he gets the job done. Easy prey though for Aldor Peacekeeper and Keeper of Uldaman. Oh i'm sorry,i have a cold. Warlock, Mage, Priest, Warrior, Roque and Shaman all struggpe massively to clear this thing without over extending resources. Fair enough, if its an empty board, deadly shot is great, but if it's full it's terrible. ... Then Soggoth told Frog, "This is my swamp." Frog could almost see a glimmer of hope as Frog tried to Entomb Soggoth, but Frog soon learned that's not how the lore goes. PS: As lucky as I was, Frog had the Equality-Holy Nova combo the next turn. Don't you just love Hearthstone RNG skill? I think the stats are okay. Basically the taunt and Elusive tags cost two mana, and you will almost certainly get more than two mana's worth of trade ins. While yes, taunt and elusive generally only cost 0-.5 mana, when combo'd together it's basically impossible to remove. Well twin emperor veklro can be removed by spells. And twin emp can only be used in c'thun decks. This card basically cost your opponent a lot of minions AND tempo, and if played on an (almost empty board), it is often undefeatable. Twin emp veklor just dies at kill comman, grand mother, infested wolf and quick shot for example. Stil leaving the other minions. This dies to like grand mother + wolf + misha, which means a lot :p (and again, you dont need to play 2 very bad and slow cthun minions before it.